Just as last quarter (also HERE) we saw that job growth had returned to more regions of the state, the latest QCEW for 2013q1 finds that this is continuing and even strengthening. While the Portland MSA returned first to job growth, even as the other regions continued to shed jobs at the start of the technical recovery, the other regions are starting to gain ground in terms of job growth. Thankfully Portland is losing its dominant share of overall growth due to strength in other regions, not becauxse Portland has slowed down. As seen below, Portland continues to add about 20,000 private sector jobs on a year-over-year basis, or at about a 2.6% rate. The state has gone from adding 20,000 jobs on a year-over-year basis two years ago to closer to 35,000 jobs in recent months. This coincides with an improvement in job growth rates from about 2.0% to 2.5% today. Not great from a historical perspective but a good improvement nonetheless for the private sector. Overall employment growth is at 1.9% in March due to continued public sector declines (-1.2% in Q1). In terms of growth by individual region, Central Oregon is way out in the lead here at over 5.5% year-over-year. 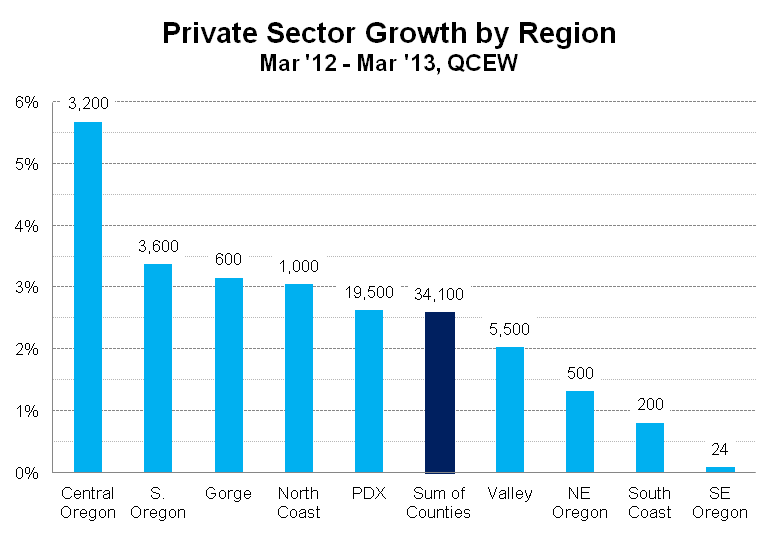 Southern Oregon, the Columbia Gorge and the North Coast are all just a bit over 3% private sector growth in the past year. The Willamette Valley, Northeastern Oregon and the South Coast are all seeing some job growth, however less than the statewide average rates. 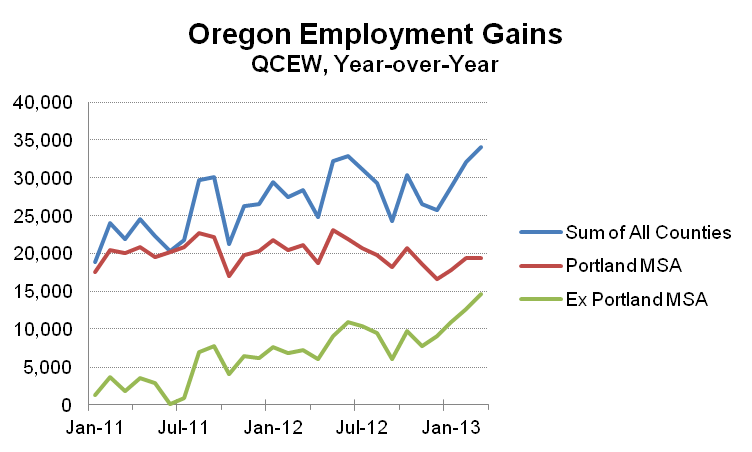 South Central and Southeastern Oregon (includes Klamath) has registered just a few job gains in the past year. Finally, just to keep consistent with last quarter and to produce Professor Emerson’s “Salem Psychedelia” graph, the following shows the share of job gains by region. Portland in March 2013 accounted for 57% of the statewide gains, compared with 90% a couple years ago. 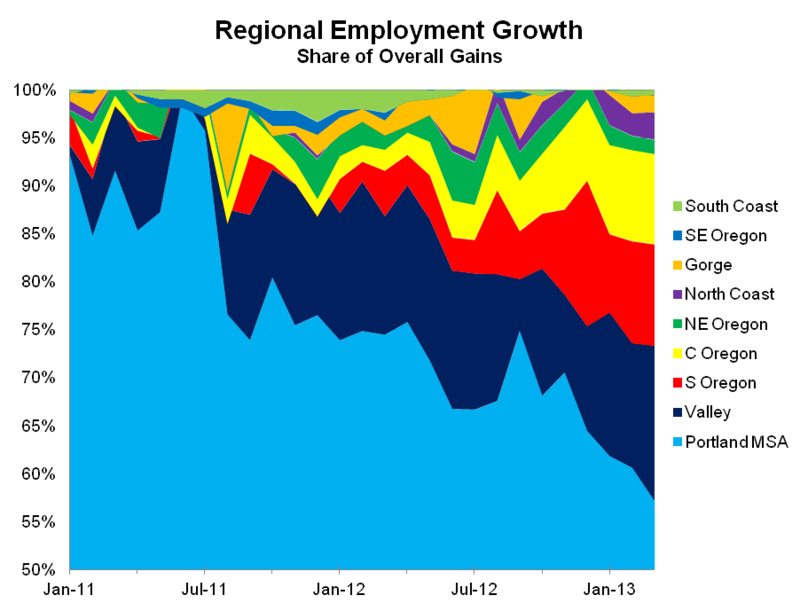 The largest improvements in share have been in Central and Southern Oregon. Seeing the recovery continue to spread to the state’s other cities and regions outside of Portland is highly encouraging and certainly needed. The pickup in growth rates is also encouraging and our baseline outlook calls for just a bit stronger growth over the next two years (2013-15 BN private sector average 2.6%). So far the data is coming in along this baseline however a full economic recovery, the feel good part of one, is still not quite here. Is this data seasonal adjusted for summer employment? What type of businesses are hiring? Data for data sake is misleading, as there appears to more empty buildings on the North Coast and more people seeking employment than last year. Overall this business data is very misleading and inaccurate.